INDIANAPOLIS (October 4, 2013) – Klipsch, a leading global speaker and headphone manufacturer, in collaboration with Klipsch Music Center, a Live Nation Entertainment venue, and Mecum Auctions, announces today the upcoming auction of the brand’s custom-made Orange County Choppers™ motorcycle featuring signatures from the world’s most famous recording artists. Debuting at Mecum’s Chicago Auction event, October 10-12, the motorcycle will be sold to the highest bidder with all funds benefitting Make-A-Wish® to help grant wishes to Indiana children with life-threatening medical conditions. Mecum’s Chicago Auction is taking the gavel to the Schaumburg Convention Center in Chicago October 10-12. Featuring historic vehicles and headline-worthy conveyances, this annual sell-off attracts hundreds of desirable collectors and enthusiasts nationwide. As Chicago’s only collector and classic car auction, this multi-day events makes for a wonderful celebration of all things automotive. The custom-made motorcycle will be available for preview at the Schaumburg Convention Center from Wednesday, October 8 through Thursday, October 9 ahead of its sale on Friday, October 11 at 6:20 p.m. EST. The auction may be viewed on Velocity TV during that time as well as live on Mecum’s website. Upon becoming the name-in-title sponsor of Indiana’s Klipsch Music Center, Klipsch unveiled plans to extend its fundraising efforts with Make-A-Wish. 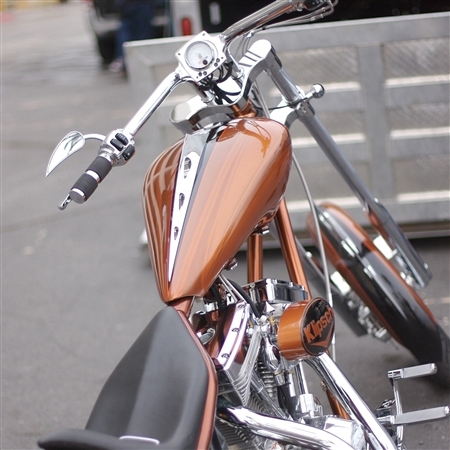 After housing the branded Orange County Choppers—equipped with Klipsch speakers—onsite at the amphitheater over the course of the 2012 concert season, the motorcycle now features more than 50 signatures from artists including Dave Matthews Band, Zac Brown Band, Lady Antebellum, KISS, Motley Crue, Def Leppard, Bush, Jimmy Buffett, Jason Mraz, Darius Rucker, Luke Bryan, Jason Aldean and Brad Paisley to name a few. Over the years, Klipsch has worked closely with Make-A-Wish in Indiana to grant wishes to children who have been diagnosed with life-threatening illnesses. For more information on Mecum Auctions, please visit http://www.mecum.com. For more information on Make-A-Wish, please visit indiana.wish.org. Make-A-Wish® Ohio, Kentucky and Indiana grants the wishes of children with life-threatening medical conditions to enrich the human experience with hope, strength and joy. Celebrating its 30th anniversary this year, Make-A-Wish Ohio, Kentucky and Indiana is the largest of the 61 Make-A-Wish® chapters in the country in terms of territory, wishes granted, children waiting for their wish to come true and potential wish children. Currently, there are more than 200 children in Indiana waiting for their wish to come true. You can help share the power of a wish® by volunteering, contributing financially, donating frequent flier miles, or remembering Make-A-Wish Ohio, Kentucky and Indiana in your planned giving by calling (877) 206-9474. Currently, Make-A-Wish is in need of volunteers in Northern and Southern Indiana. For more information, visit our website at indiana.wish.org.